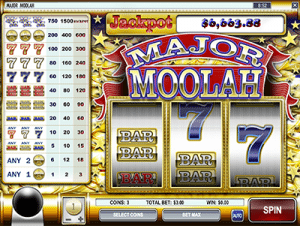 Major Moolah is a three reel, progressive jackpot pokie game from software developer, Rival Gaming. Not to be confused with the life-changing progressive jackpot games Mega Moolah or Mega Fortune, Major Moolah still offers some very tempting wins, with a jackpot sitting on average around the $6,000 mark. Due to its simple game format and big winning potential, Major Moolah is a popular title with online players. Despite the brands shining reputation, Rival games can only be found at a select few online casinos. Our favourite pokies site to play Major Moolah for real money bets is Slots Million which is an online casino dedicated 100 per cent to the pokies. All games at Slots Million are available for instant-play, which means they’re available directly over your Web browser without having to worry about any downloads. Slots Million accepts deposits in AUD using a range of trusted payment methods, including Visa, MasterCard, Paysfecard, Neteller and Skrill. You can find Major Moolah by typing the title directly into Slots Million’s search field, or by searching via game supplier using the advanced search option. Here you’ll also find a huge range of pokies from all the leading software providers on the Net, including Microgaming, Net Entertainment, iSoftBet, QuickSpin, BetSoft, Thunderkick and heaps more. Major Moolah has a theoretical RTP (return to player) or 96%. It’s available for instant-play directly over your Web browser with no downloads required. As a three-reel pokies game, Major Moolah is incredibly simple to play. It operates on one fixed payline, so all you need to do is select the amount of your bet by clicking the ‘select coins’ button at the bottom of the reels. You can choose to bet either one, two or three coins, which will cost you $1, $2, or $3 respectively. It’s vital to note that in order to win the progressive jackpot, the maximum bet of $3 must be in place. You can do this easily just by hitting the ‘bet max’ button. Unlike many progressive jackpot pokies, Major moolah can be played in practice mode for free, so you can familiarise yourself with the format of the game before laying down any of your own real money wagers. Try it for free or real cash bets at Slots Million. Major Moolah is a progressive jackpot game, which means the maximum amount that can be won increases by a small portion every time a real money bet is placed on it within the linked network. The current running jackpot for the game is displayed at the top of the reels at all times, so you can literally watch it increase before your eyes. 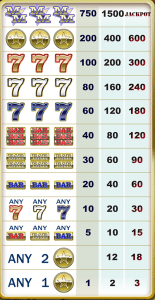 To see all the amounts that you stand to win per spin, have a look at the pay table displayed to the left of the reels. This shows you all the potential winning combinations and how much you can win based on the size of your bet. To trigger the progressive jackpot, you’ll need to be playing the maximum bet and trigger an appearance of three of the MM logos in one payline. Major Moolah tips its hat to the original one-armed-bandit machines, offering a simple three reel, one-line format with no bells or whistles. There are no free spins or special bonus rounds – what you see is what you get. Depending on the type of games you prefer, this will either appeal to you or turn you away. Those who prefer the nostalgia and simplicity of classic slots will love Major Moolah, especially thanks to its lucrative progressive jackpot. For those who enjoy pokies with more advanced animation and bonus features, try a more modernised five-reel progressive jackpot game, like Microgaming’s Mega Moolah or BetSoft’s Mega Glam Life – both which are available to play at Slots Million. Rival Powered is a provider of online casino games that’s been in operation since 2006. The brand currently offers over 160 unique real money games available for play on both desktop and mobile, including the innovative i-Slots collection which are story based pokie machines that allow the player to progress through a storyline while playing for real money. Rival’s company mission is to “build games people love to play and provide services and support to bring those games to the market effectively” which is something they’ve certainly accomplished. You can try a range of Rival’s popular pokies at Slots Million, including hot titles like Thunderbird, Frogged, Golden Gorilla, Mystic Wolf, Jackpot 5X Wins, Lost Secret of Atlantis and a Day at the Derby. Sign up to play Major Moolah at Slots Million and you’ll receive up to $100 in bonus money plus 100 free spins to use on selected NetEnt pokies.